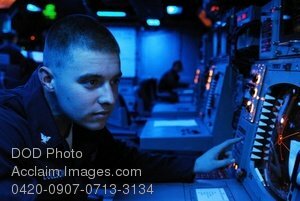 Description: Free, public domain image: Navy Controlman Watching Fire Control Radar Panel. U.S. Navy Fire Controlman 3rd Class Christopher Coulson watches the fire control radar to track and follow enemy aircraft in the Combat Information Center on board amphibious assault ship USS Essex (LHD 2) Nov. 16, 2007. (U.S. Navy photo by Mass Communication Specialist Seaman Andrew Brantley).